It rained all night. Last evening’s simmering anger of lazy thunder and high lightning gave way to a steady rain of acceptance. The desert quieted. Once again there was no wind, only the gentle slosh of rain lapping the skylight. Soothing, lovely and renewing. 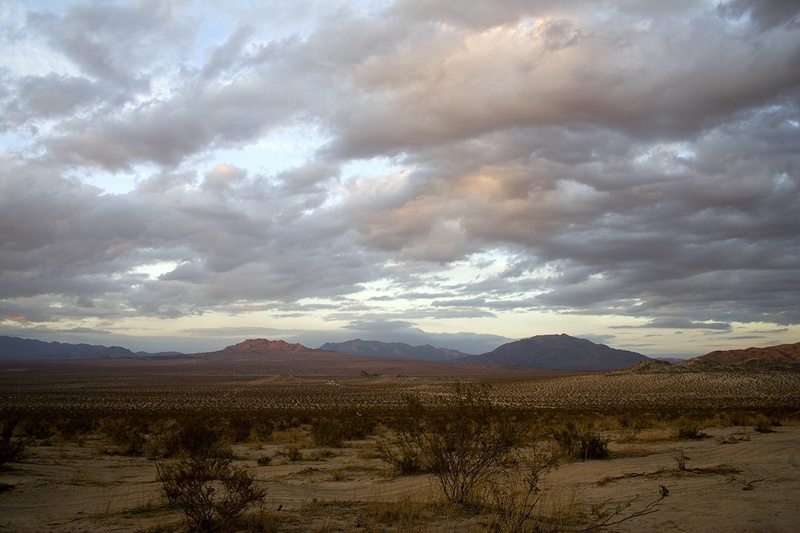 By morning the rain had mostly dissipated but the sky remained low and heavy, gray and white, clouds hanging in the hills and drifting across the lower desert toward everywhere and nowhere. The early temperature was a pleasant 68º, the humidity a whopping 90%. The ground was, naturally, wet. There were surprisingly few bugs, and only one squished toad as Riley and I made our way through the dense air to nowhere and anywhere he could pee, sniff, explore, and whine. All of the usual Riley morning things. While he was doing his thing, I watched the desert and caught my breath. The colors. The Sonoran desert, at least this part of it, is always green, surprisingly. Light green saguaros and prickly pear next to purple whipple cholla. Palo verde trees and mesquite leaves. It stretches forever and away, as far as can be seen. It’s beautiful, lush, quieting, especially in the early morning after a night of rain. But this morning, the colors had turned from green to aquamarine. Everything was tinged with blue. Because of the rain, the ground was darker than usual, as were the tree trunks and branches. That darkness served as a dramatic backdrop to this new color. It stretched up into the canyons and down into the desert, and made the land glow even under cloud cover. Note the spelling of the word “colour,” with a ‘u.’ The British spelling. Bad Company was an English hard rock supergroup formed in Westminster, London in 1973. So that makes perfect sense. Supergroup evidently means that the members of the group were already successful as solo artists or as parts of other successful groups. That was something new I learned today. I also learned that I wanted new colors (colours) to describe what I saw in the desert this morning. It wasn’t just green; it wasn’t really blue. It definitely wasn’t silver, blue or gold. But it was green, blue, and platinum. The green and the blue melted together, the platinum made it seem jewel-like, glorious and rich. The color of the morning I’m told. I’m in San Carlos Mexico for the weekend. It's a small town, authentically Mexican, located on the Sea of Cortez. I drove down with a friend of mine on Friday afternoon, a straight shot through Sonora, past Hermosillo and then on down into this small city of no more than 15,000 people. It's hot and almost excruciatingly humid. As I type this at the bar in Susan’s kitchen, the outside temp is nearly 88 degrees and the humidity is 68 percent. Heavy monsoon clouds - monzon - rim the city and the bay where the house is located. I doubt they'll get all the way to us and I'm not sure it would do much to relieve the humidity if they did. The houses here are almost like row houses. Very little space separates each one, sometimes no more than a tiny pass-through. It is legal to build right up to the line of your property here. Susan’s house is on the beach, literally with steps off the covered patio leading down into rocky shell strewn sand. The water laps at the shore line, thirsty and looking for relief from an unrelenting heat. It's a constant soothing sound, melodic and mesmerizing, like the gentle tick of a metronome. It's blue and green, the water, turning brown as it rolls onto the shore because of the sand it stirs up along the way. The water temperature is easily in the 80s. It is the definition of bath water, warmer than anything I've experienced including in Hawaii. It's almost too warm, not offering as much refreshment as one would like when trying to escape the suffocation of the air. It also has a heavy salt content, leaving your skin soft and sticky. Currently there are two people in the water. It's a small beach, open to the public but the public, what there is of it, is elsewhere. It's 3:30 in the afternoon. Perhaps siesta time. Along the many hills, high above the water, sit Mediterranean style estates, white cliff dwellers with an exquisite view of one of two marinas, alive with big, private fishing boats and masted sailboats. There are also a number of abandoned building projects, condos that are nothing more than a shell of concrete and steel, left by developers who lost their funding or lost interest. They do things differently down here. It's a slower lifestyle, a decidedly non-urgent approach to anything. When asked if someone can do something, the inevitable answer is always si - yes. Manana. But they often don't show up and if they do, the job isn't always completed to specifications. It's simply how it is. But the people are real and true, kind. It is impossible to pass someone on the beach or on a walkway without getting a big Buenos Dias. It's infectious, the kindness and the smile. I have always been a big fan of Mexico, and remain so. It has been some years since I've been for no reason other than life rushes by often at breakneck speed. It was just yesterday that it was ten years ago. The people are kind, the food incredible, the weather hot but the water wet. This morning we had omelets - omlettas - with chorizo and San Marcos sauce, a tomato based concoction that has peppers and onions. We went to Susan's boat which is actually the purpose of our trip. She brought two big batteries down with her. Captain Gerardo had them installed and we went out for a tour. It was choppy, the wind creating white caps, but it was glorious, relaxing. It’s what I remember most about Mexico, the relaxation. And the view from here. Once we had a beast in the house, and today it was murdered. It was brutal. It was ugly. It was Riley. Our boys have always been toy destroyers. Maguire, dog rest his beautiful soul, used to love plastic toys that he would squeeze once or twice before managing to get one of his canines inside the squeaker hole which would create a breech which would give him the opening he needed. Death, destruction and way too many pieces of plastic ensued. As he got older, his need to destroy evaporated. He would simply chew a bit to elicit a squeak, then rest his head on whatever toy he had at the moment. Cooper, dog rest his tortured little soul, pulled apart his cloth toys but not very often and not with such visceral intent. I think it’s because Maguire was a pup and Cooper wasn’t. Cooper liked to, instead, gather all of his guys together, sometimes six or seven at a time, make a pile and then lay his head on them. We called it his harem. And then there’s the killer. Riley has never met a toy he couldn’t destroy in minutes. He doesn’t always destroy them all that quickly; it depends on his mood. And the toy. Certain toys are toast within 10 minutes. It’s why I often buy toys out of the bargain bin. The one guy that seems to last a bit longer is Wubba, except when it doesn’t. Wubba lasts roughly three months before needing to be replaced. Except this last Wubba that lasted three days. And Wubba is expensive. Last week, when I was at PetCo getting a new Wubba, I also got Beast. Beast was a bone-shaped toy with a rope through it. It was in the bargain bin. It was $5. We have always named all of the toys for all of our boys. Our boys have also been very smart and know their toys by name. So when we named Beast we did so because printed on the side of Beast was actually the words “King of the Beasts.” Who knows why. Naming the toy King didn’t seem right and so Beast it was. Beast was very popular. He got carried around the house and taken out on the deck in the morning to watch the desert go by alongside his Royal Rileyness. But this afternoon, Riley settled down in my office with Beast in his mouth and proceeded to tear the thing apart. Then he picked up what was left and moved into the great room to tear the rest apart. It was obvious from his complete focus that he had one goal: Kill the Beast. Today, in Tucson, on the hill, under the gathering storm clouds and the still hovering smoke of the Burro fire, Riley killed his beast. Sadly, I suppose. But he did it while living it out loud. The Burro Fire, so named for its origins near the area of Burro Tank, is burning within 4 miles of our house. The fire started on Friday morning, is currently under investigation as to its origin, and has burned some 15,000 acres in the mountains just to the east of us. A little too close for comfort. This morning, as for the past couple of mornings, I looked out the window to the east and was pleasantly surprised to see nothing but blue sky. I took Riley for a walk (Kevin had something else to do) and as we made our way back, again facing east, we saw nothing bad as far as smoke was concerned. That quickly changed. By mid-morning, plumes began to rise in the sky. By late afternoon, the sky was once again thick with brown smoke. By dusk, it was Armageddon, the sky black and ominous. We followed it closely on several websites. Inciweb is phenomenal. The local firefighters and emergency response people also set up a Facebook page and tonight live-streamed a meeting where they gave an update and took questions. We watched the whole thing. There is not a lot of ground support at this point simply because the terrain is so horrific. In the meeting, they talked about maintaining the perimeter they had established, using tankers and helicopters as much as possible to keep the fire from spreading until later this week when the hoped for monsoons are supposed to arrive and provide what they call weather related relief. Would that it were so. All day long we heard the drone of aircraft. In addition to the hotshots, the ground crews who fight wildfires, there were three helicopters, one water tender, and 14 engines. Those engines, I’ve been led to believe, are spotters as well as what they call VLATs. VLAT stands for Very Large Air Tanker, believe it or not. It’s also true. These very large air tankers are actually modified DC-10s fitted with fire retardant delivery systems. Each is capable of dumping 11,600 gallons in a single run in eight seconds. They were first used in 2006 in San Bernardino County. Here, they fly out of Mesa and Fort Huachuca, refueling and then flying directly into the fire to drop their retardant to try to stop the fire or at least slow it down. To maintain. We watched these monsters fly low over the house and into the smoke, their belly’s red, their wings white. They were heavy and loud, and we were in awe. They represented hope and strength and perseverance. Every time we’d hear the heavy engine we’d go outside and watch. And wait for them to help deliver us from impending doom. The men and women who fly these tankers are amazing. The hotshot firefighters are incredible. The other air personnel and ground personnel should be applauded. We watched, we listened, we hoped. We don’t pray or we would have done that, too. The VLATs were here to help. And we celebrate them.